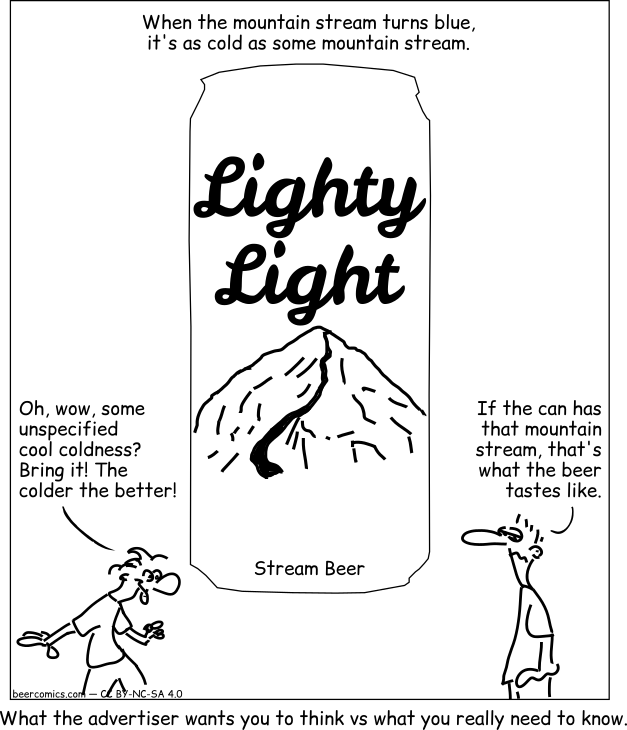 Lighty Light mountain stream coldness indicator ad: What the advertiser wants you to think vs what you really need to know. Oh, wow, some unspecified cool coldness? Bring it! The colder the better! When the mountain stream turns blue, it's as cold as some mountain stream. If the can has that mountain stream, that's what the beer tastes like. Cold as a mountain stream by Robert Wenner is licensed under a Creative Commons Attribution - NonCommercial - ShareAlike 4.0 International License. Permissions beyond the scope of this license may be available upon request at https://beercomics.com/imprint.html.